Foundations is designed for students who have a mastery of phonics and are now learning to read for meaning. Students will learn to combine the most important prefixes and suffixes with words they already know. They will also learn the spelling and grammar rules related to suffixes, including the dropped ‘e’, the doubling principle, and change 'y' to 'i'. In year 2 of Foundations, students will even learn about assimilated prefixes! Elements is designed for students who have a mastery of phonics, a good working knowledge of prefixes and suffixes, and who are exposed to academic text in all of their subjects. Students will learn how English words are built and strategies to determine pieces of meaning embedded in words. Weekly study is focused on Latin and Greek-based root families. Elements Level 1 concentrates on the roots with the highest numbers of simple and intermediate words. Elements 2 and 3 focus on roots used in words of ever increasing complexity. Always start with Foundations Level 1 or Elements level 1 regardless of age. Do you need the Teacher Edition? YES! 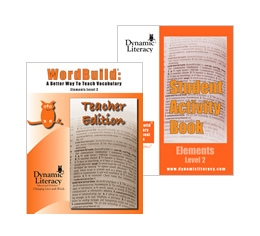 In addition to exercise answer keys and tests, the Teacher Editions include all kinds of information about each root, prefix, or suffix being studied, as well as guidance on how to teach effectively in individual, small group, or large group settings.